You see the words “college” and “university” a lot when you read about places in higher education. And it can be confusing. The difference between a college and a university is a matter of size. UC Davis is, in fact, a large university — a university made up of four colleges that teach both undergraduates and graduates. Our majors and academic programs are organized within these colleges. Similar to the way young wizards are assigned into the four houses at Hogwarts, students at UC Davis are assigned into our four undergraduate colleges: the College of Agricultural and Environmental Sciences, the College of Biological Sciences, the College of Engineering, and the College of Letters and Science. When you apply to UC Davis, you choose a major, which automatically places you into one of these colleges. For many students, knowing which college they belong to doesn’t become important until they need to see an advisor, have a petition signed to drop a class or take medical leave. Get in the know and avoid last-minute panic attacks when you need help with your major, but don’t know where to go. Here’s a quick tutorial on how your major determines your college, and why that matters. For example, if you want to major in biotechnology, the major is administratively housed in the College of Agricultural and Environmental Sciences. But if you decide to change majors, say to microbiology, the College of Agricultural and Environmental Sciences would help you move to the College of Biological Sciences, where microbiology is housed. What it means to belong to a “college” varies significantly from one UC campus to another. On some sister campuses, the college you select determines your general education requirements or your campus living community. Some UC campuses let you change colleges, others only let you change majors. What happens if you are undeclared? 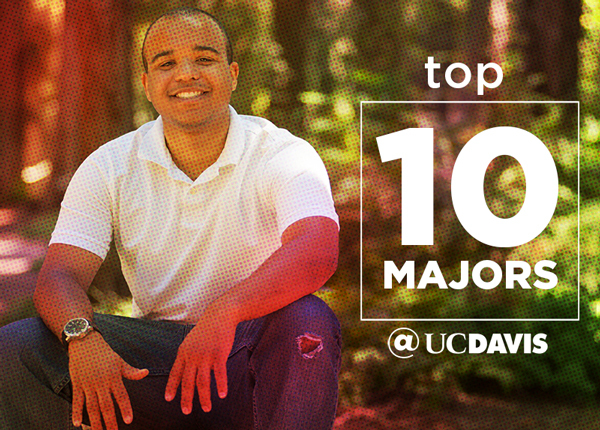 At UC Davis, you apply to a major. If you’re accepted, we’ll place you in the corresponding college. The only exception to this is that if you decide to enroll as “undeclared.” UC Davis will then ask you to select a college. For example, you can be “undeclared” life sciences major within the College of Biological Sciences, or “undeclared” in the humanities or fine arts within the College of Letters and Science. I know, bureaucracy can be confusing. Robin DeRieux is a senior writer for the College of Agricultural and Environmental Sciences whose three sons have all attended UC campuses. She rides her bike to UC Davis no matter rain, sleet or snow. Well so far, there hasn’t been any sleet or snow.